This thing hits with a sledgehammer of nostalgia as soon as it starts. 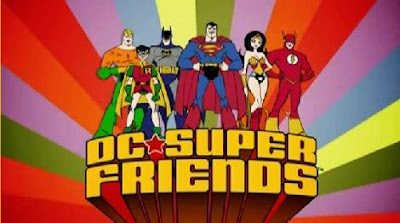 Just look at the opening shot, the character design is much more stylized then the old Super Friends, but it has that old school feel. The intro is just like the one they used in the old Legion of Doom episodes. Despite being shown in the intro, Wonder Woman, Aquaman, and Robin all sit this adventure out. The invisible jet makes an appearance at one point, but no Wonder Woman. 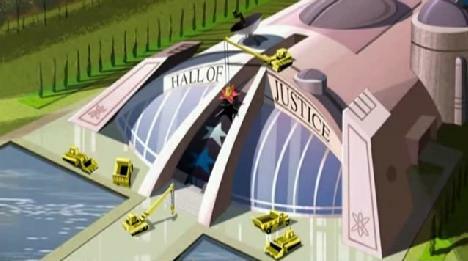 The episode starts with an under construction Hall of Justice. The announcer lets us know that it is located in Metropolis. That was surprising to me for some reason, but after looking it up I see that it has been located there in some of its other versions too. The narrator informs us that Batman and Superman are overseeing the construction while the other members of the Super Friends are out on patrol. The hall is almost finished when Batman shows Superman their hard light holographic training area. As soon as it’s mentioned you know something bad is going to happen in there. As soon as Batman shows off these solid holograms the doors seal shut. Batman jumps on the controls while Superman tries to pry the doors open. Batman’s design here is pretty neat; there are detail lines all down his costume very similar to how he appeared in the Arkham Asylum games. Daran Norris voices Batman here and he is pretty good, but not standout. David Kaye pulls double duty on Superman and Hawkman. His Supes is okay, he knocks Hawkman out of the park though. Superman opens the doors just enough to find out the doors are lined with Kryptonite. So this episode is going to fall into that lets depower Superman quickly so we can challenge everyone trap that early Justice League episodes fell into. Just as Superman falls back from the Kryptonite the dark room begins filling with “HA”s. That’s right, a holographic Joker appears. The animators ran with the idea that they could make anything appear since they were all holograms. John Kassir also delivers a very strong Joker. Joker lets Batman and Superman know that he has turned the Hall of Justice into the Joker’s playhouse. The blackness and the “Ha Ha”s pull away and are heroes find themselves knee deep in a holographic swamp. Joker makes a Solomon Grundy and a number of mud monsters to join them in the swamp. Batman uses his utility belt to call the rest of the Super Friends. Flash gets the call first. He’s voiced by Eric Bauza and I have to same I’m disappointed with the voice. It just came off a little too high pitched. 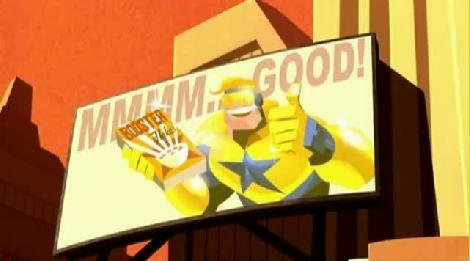 Hawkman is next to get the call and he flies by a billboard with Booster Gold on it!! Hawkman calls Cyborg (voice by Phil LaMarr) and is told that all the other Super Friends are currently dispatched across the globe. 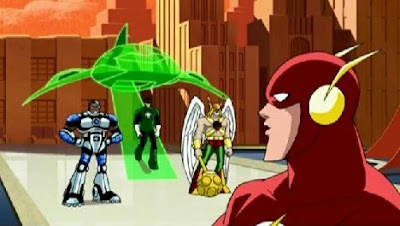 Cyborg asks if Green Lantern is in town and Hal is shown flying the construct jet that the DVD comes with! Very cool little nod to the toy. Phil is good as Cyborg. Grant Moninger voices Green Lantern and the Ted Knight sound-alike narrator. His Green Lantern sounds a bit off to me. In fact he still sounds a little like Ted Knight. He tells everyone to meet at the Hall of Justice’s secret entrance. Flash is the first person to get there and we get the first indication of his personality. You probably already guessed it; he’s the jokester who rushes ahead. Green Lantern seems takes the lead and advises everyone to split up and search for Batman and Superman. Cyborg thinks it is a better idea to stick together, but before anyone can debate it Flash rushes ahead. He finds giant wrapped presents that say that are for him. Even he recognizes that it is obviously a trap. Then Jokers pop out of them like jack in the boxes and try to hit the Flash with hammers. Not being able to hit him one of them pulls out a bazooka fires a pie with a bomb in it. As Flash is running from the pies he runs into a gum trap, sticking his feet to the floor. It appears when the Flash took off the others did split up, because the scene then switches to Hawkman flying through the garage. 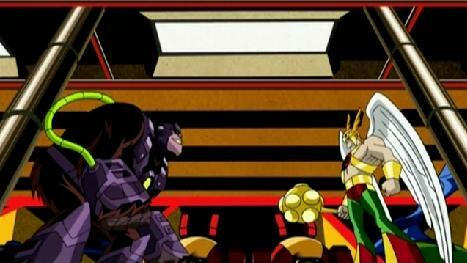 Hawkman is checking in with the others when he is attacked by Gorilla Grodd. Phil Lamar does a great job voicing this high-tech Grodd design. Grodd takes control over all the vehicles in the garage sending robot suits, helicopters, etc after Hawkman. 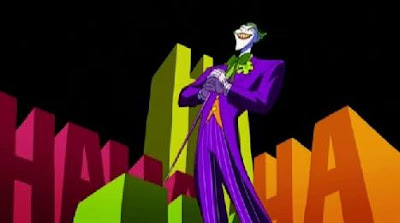 Cyborg hears Joker laughing in his own room and finds himself trapped in a giant vector graphics style video game. I guess his room is also outfitted with hard light holograms? That part isn’t really ever explained. 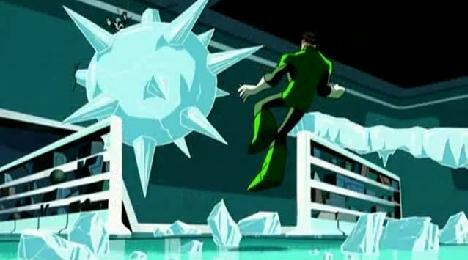 Green Lantern is attacked by Mr. Freeze. Eric Bauza does a much better job voicing Freeze then he does on the Flash. The resulting fight is very well done with Freeze making objects out of ice while Hal creates constructs with his ring. It looks like Hal is going to win the fight when Freeze presses a button on his gauntlet and a giant yellow ball falls on Green Lantern. Hall awakes to see everything in the ball is yellow and there is a timer counting down. When the camera view cuts to the outside you see he is actually trapped in a giant Joker smiley face. The best part of this is Mr. Freeze telling Green Lantern that his powers won't work on yellow like Hal doesn't know his own weakness. Things look bleak for our heroes don’t they? 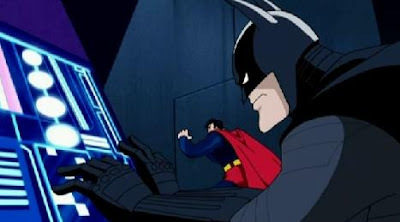 Superman is depowered and trapped with Batman in the holodeck, I mean danger room, I mean holgraphic training room. Flash is stuck to the floor, Green Lantern is stuck in a smiley face, Cyborg is caught in a real life videogame, and Hawkman is fighting the all the vehicles in the Super Friend’s garage. How will they ever get out of this situation?? Well you’re going to have to check back next tomorrow to find out! I love your insight, but I'm still wondering what this DVD/episode is for or from. My son loves the Imaginext line, and at five though I got him some of the "Superfriends" line of toys, most of which are featured in this episode. The line is discontinued, but all the main characters in the episodes (super hero wise) were all characters from that toy line. (Except Hal Jordan/Green Lantern, they had John Sterwart/Green Lantern as a toy.) I wonder if this was an attempt to produce a pilot for that toyline that never got off the ground. Although the Joker in the episode has a voice that sounds almost like it could be the voice from the Imaginext Joker's Playhouse set. The episode name and even the "hahaha" design look to be lifted off the Joker playset. Hal's jet in the episode is based off the toy. It may have been a failed pilot, or it may have just been for the Imainext website like the 5 Imaginext cartoons for their other toy lines. Sorry I don't have more background info. I would have loved to seen more too. Thanks for reading.